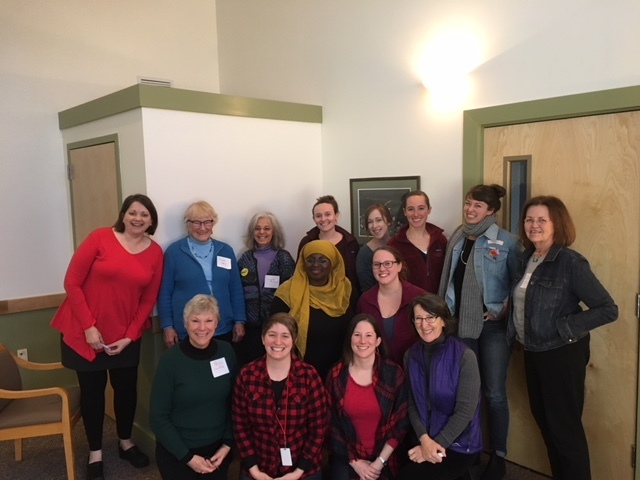 Last weekend, 12 dedicated women joined Maine Family Planning staff for the inaugural, intensive Fighting Forward Abortion Advocacy Training. While hundreds of Mainers participated in anniversary Women’s Marches and related events, our spirit of resistance to attacks on reproductive rights took a less visible but equally important form. The impetus for the training was a desire to honor 45 years since Roe v. Wade made abortion legal in the United States, while addressing the stubborn existence of social, medical, and political stigma that pushes meaningful access to abortion out of reach for too many. After an intensive year of ongoing mobilization and passionate lobbying of elected officials—something that is new for many and familiar to others—there are Mainers who are ready to deepen their skill sets and diversify tactics. We recognize that even though a majority of Americans support abortion rights in most instances, mystification remains about the procedure itself, the realities of access, and how to deeply engage with others about a topic so shrouded in stigma. Fighting Forward set out to demystify the clinical procedure and marry this new understanding with exercises that foreground values-based conversations supported by data from reputable sources. Our inaugural class jumped right in, sharing their most pressing questions and the rhetoric they’ve found most difficult to engage, as well as how their personal values and views around abortion may have shifted over time. This inspiring, inter-generational group of women, who hailed from communities including Fairfield, Portland, Belfast, and Orono, modeled how to bring the raging spirit of a march to the quiet, daily conversations that shift our language, thinking, and actions away from stigma and toward a world where rights to bodily autonomy and self-determination are actualized. We couldn’t be more proud to play a role in helping champions of reproductive rights find their voices. Saturday was just the first of several trainings Maine Family Planning staff will complete this year with cohorts across the state. Our goal is to foster a statewide network of informed, skilled, and confident abortion rights advocates who are prepared to instigate culture shifts and push for significant legislative victories on reproductive rights. Following this first session, we can already feel how much more powerful our passion becomes when we make investments in each other’s’ leadership and channel our energies effectively. We’re digging in for the long haul, and we can’t wait for you to join us!